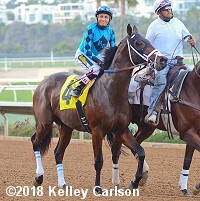 Jockey Joe Talamo celebrates aboard Mucho Gusto after winning the Bob Hope Stakes. 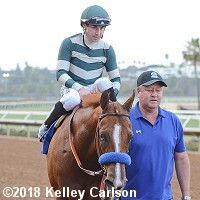 The feature race on the second Saturday of the Bing Crosby Season was the $100,000 Bob Hope Stakes (G3) for two-year-olds sprinting 7 furlongs on the main track. Conditions were excellent with partly cloudy skies and temperatures in the high 60's, with 6,325 fans in attendance at the seaside oval. After 2 scratches, a field of just 5 went to post. Mucho Gusto was sent off as the 4-5 favorite, exiting his debut win by 4 lengths on September 20 at Los Alamitos. 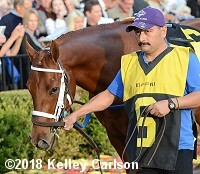 In to challenge him included 11-4 second choice Sparky Ville, 2nd in the Best Pal Stakes (G2) but 6th in the Del Mar Futurity (G1) before winning the Sunny Slope Stakes, and 7-2 third choice Extra Hope, a maiden winner by 8 3/4 lengths last out in his 4th try. After getting crowded at the start, jockey Joe Talamo sent Mucho Gusto down to the rail and to the lead exiting the chute and he set fractions of 22.36 and 46.36 while pressed by 7-1 Savagery and stalked by Sparky Ville. Turning for home, Mucho Gusto continued to hold a short lead over the tirng Sparky Ville through 3/4 in 1:10.32. Kept to task by Talamo, Mucho Gusto pulled away late to win by 1 1/2 lengths over Savagery in 1:23.51 over the fast main track. It was a head back to Sparky Ville third, and 3/4 more to Extra Hope fourth. 26-1 longest shot Owning was a long 14 lengths behind Extra Hope. Left: Mucho Gusto in the winner's circle. 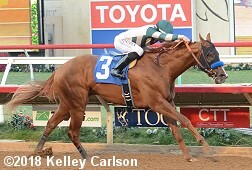 Winning jockey Joe Talamo said, "I've been very excited to ride this horse. And after this race, I'd say I'm really impressed with him. We got sandwiched coming away from there, but he went on about his business. He ran well throughout; he was well within himself, with his ears up. When a horse would come to him, he'd pick it back up again. He's trained well right from the start and he's showing his stuff in the afternoons." This is Talamo's first Bob Hope Stakes win and his 52nd stakes win at Del Mar. 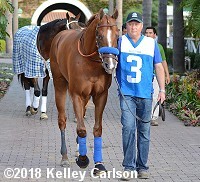 Right: Mucho Gusto in the paddock before the race. Winning trainer Bob Baffert said, "I lost time when he got sick and this was a good race for him. He's a pretty cool horse; there's nothing flashy about him but he gets the job done. They went fast early but when they came to him, he rebroke like the good ones do. I was with my assistant and I said 'Here's when you find out what they're made of.'" 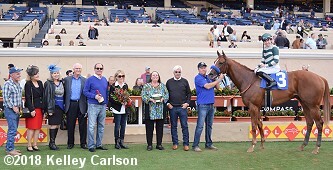 This is Baffert's third Bob Hope Stakes win after Toews on Ice in 2015 and Mastery in 2016, and extends his all-time lead in Del Mar stakes wins by a trainer to 128. Left: Second place finisher Savagery in the post parade. Jockey Rafael Bejarano said, "He broke well, but I saw the winner go right to the front, so I just sat off him. When it came time, I asked my horse and he gave it a good try. He's a good young horse and he's still learning. He'll be better for this." Right: Third place finisher Sparky Ville in the paddock before the race. Jockey Gary Stevens said, "He ran well. He got a bit too wound up in the post parade and that didn't help. But he ran a good race."